Considering a color change? Addicted to the bottle? This will enlighten you! One of London's leading hair colourists, Jenna Norman from Daniel Hersheson, told us how it is from the other side of the salon chair. If you're a curious color virgin or a frequent dyer these are the things a colorist is just *dyeing* for you to know. 1. A picture can tell a thousand words. Do bring photos of what you like and don't like as people see color differently so it always helps. But be realistic, celebs have often had hours of styling with hairpieces or even Photoshopping, so there's no guarantee yours will look so picture-perfect all the time! 2. The best way to lighten up if you're dark. If you're naturally quite dark and want to go lighter don't try to go too light as an all-over color. Instead use your natural base and go lighter with pieces—this also helps to avoid unwanted orange tones. 3. Coloring and lightening are actually opposites. If you plan to go darker or stay a similar shade, this involves popping color molecules into the hair shaft. But if you're having it lightened, that process involves removing the molecules (melanin) from your hair, making it look lighter. 4. Having cut and color? Do it in this order. If you're feeling a big chop as well as a color, book your haircut first—this helps your colorist to visualize color placement. Color should frame your face and compliment your haircut, it's not just about putting as many highlights in as possible; sometimes less is more. 5. We need to know your history. Be honest about your colour history, its better we know if you colored your hair at home, or if you were red last year, for example. Color may fade but if you have long hair and your last color was two years ago, chances are it's still in there! We aren't magicians! Please know that sometimes coloring your hair is a journey. As much as we would love to get you from red or black to blonde in one go, sometimes we just can't. Trust your colorist, and be patient. 7. You can burn your color on holiday. Don't forget to protect your color while you're on vacation. Blondes get burnt and turn yellow, and brunettes can turn orange. Ask your colorist for take-home glosses to keep your tones right. 8. We recommend professional products for a reason. 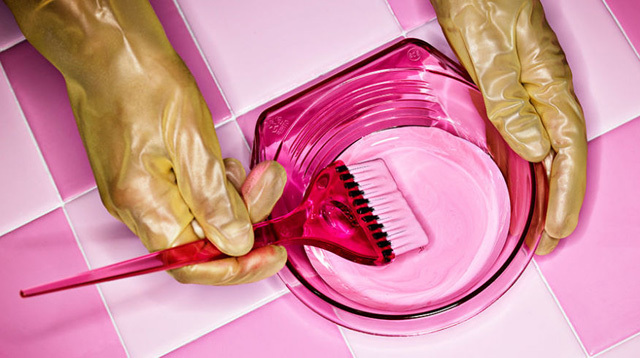 Use professional hair care after coloring—it is so important to use good shampoos, conditioners, and treatments. Why spend so much money on getting your color right then wash it with something that makes it fade? 9. Don't just focus on your roots. It's important to regularly tweak your color as well as getting your roots done—letting your colorist make small changes is key to keeping your hair fresh and current. The same root touch-up every time doesn't always cut it! 10. You should demand the best colour technology. Look out for salons that stock "OLAPLEX." It rebuilds bonds making hair stronger and healthier. It's been the colorists' best kept secret–until now!